You have been given the responsibility for buying two way business radios. You have looked at the market place and see a multitude of manufacturers and two way radio solutions and are even more confused than when you started. You now find yourself asking a huge range of questions from how do you even start looking, how do you stay on budget, and what do you even look for? Well we have put this simple 12 Point Guide together to navigate you through the process of matching your business communication needs to our range of Icom two way business radio solutions. Hopefully by following these tips we will make the process a lot faster, simpler for you and avoid any frustrations. Hopefully you will have already answered this question; you already know that you need to keep in touch with your staff. You know you want an efficient, simple, effective solution that you can control and easily manage. Two way business radio can do all that. Depending on your needs and the applications you use, they can increase safety, improve productivity; provide better customer or employee satisfaction and contribute to making you more profitable. 1. What can two way business radios do for me? Two way business radio is a very flexible form of communication. It can provide simple one to one communication between a small group of users or increase the number of channels so you could have one channel for everyone, one channel for management, one channel for security, one channel for cleaning and so on. You can use each channel like an intercom system that lets you call individual people or groups instead of broadcasting a message to everyone. Some radios have scanning capability so your radios will only pick up conversation for the channels you have programmed. Dependent on your needs you can build a complex radio system integrating not just radio communication but security monitoring via GPS or CCTV or coverage between groups over a wide geographical area using the internet. 2. Who will use them? 3. Where will I use the two way business radios? Look at where you want to use them, in buildings, out on site in vehicles, perimeter patrolling, define your needs and then get your local Icom dealer to advise on the best way to give you coverage of that area. A quick ‘rule of thumb’ is that VHF travels furthest outdoors whereas UHF is better for local onsite use (within buildings etc), but take advice from your dealer for the best solution. 4. Two Way Business Radio vs. Mobile Phones? • When you want to call someone on a mobile phone at a minimum you have to press a speed dial button and wait for connection. Between the dialing and the time delay of the person on the other end answering, some time can go by (if they answer at all). With a two way radio you simply press a button and start talking. In an emergency situation, this speed could be critical. •	You can talk to multiple users at once. •	There is no monthly contract with two way radios. You never have to worry about exceeding your allotted time like you would do with a mobile phone. •	Icom radios are built to military specification which means that they will work in wet environment or even after they are dropped on concrete. Most mobile phone are not built to this standard. •	Two way radios continue to work in natural disasters or major security incidents. Even if mobile phones do work, the mobile phone tower can get overloaded with everyone trying to make calls so your call may not go through. 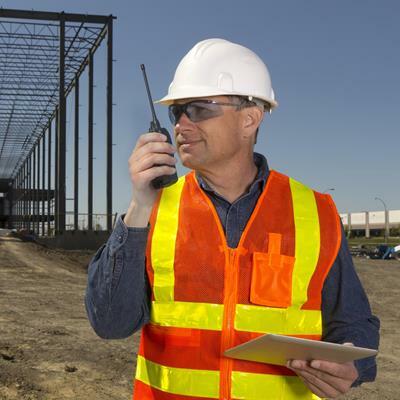 •	Two way radios stay on site at the end of the day so can be used by shift or night workers. •	There may be places in your business where mobile phones don’t work. Two way radios can reach all areas of your business, when repeaters are installed. 5. So what types of two way business radio are there? Two way radios are essentially available in four types: handheld, vehicle mounted mobile, desk top base station and repeater base station. • Handheld two way radios are the walkie talkie type of radios you see people carrying around. • Vehicle mounted mobile two way radios mount in a car or truck and they use the vehicle's battery for power. They will achieve better range by using an externally mounted antenna on the vehicle. •	Two Way Radio repeaters are essentially radios that increase the operational range of your PMR radio system. Repeaters can be used to cover areas in your business where a two way radio will not transmit or receive. A repeater receives the transmission of a two way radio and rebroadcasts it further. Every Icom two way business radio is repeater capable, from the low cost IC-F1000 series to the advanced IC-F3400D digital two way radio series. 6. How do I choose what sort of two way radio system I need? Today's two way radios have lots of functions and features. However, which ones do you really need? • Are the radios going to be used by just a few people? • Are you in an area where only a few radios are used? As with all business decisions, you will need to find out what you want to get out of a two way radio system. There is a lot to think about. A good starting point is getting an Icom business radio dealer involved will be able to guide you through your options and will have the skills to put a radio system together. He will have the local expertise to help you with licensing, installation and after sales support. 7. Analogue or Digital Two Way Business Radio? Having outlined the types of two way business radios there are, there is another choice, whether to choose analogue or digital. If you have a radio system already, it will most probably be an analogue system. 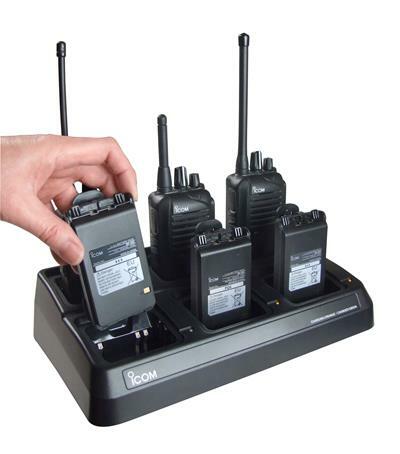 Icom have a digital two way radio solution called IDAS (Icom Digital Advanced System) which is capable of analogue, digital or digital/analogue mixed mode operation. This means that they can receive both analogue and digital mode signals on a single channel. Mixed mode operation is a benefit as there is no need to buy a complete system outright and allows you to migrate from analogue to digital at your own pace, an important consideration in the current economic climate. There is nothing wrong with purchasing an analogue radio and they will still be around for some considerable time. But there is a clear business case for digital business radio. As well as future proofing your communication needs, Icom digital radios are incredibly spectrum efficient, doubling the number of potential users on the traditional current channel capacity of 12.5 kHz. In addition, IDAS radios feature outstanding audio and superb noise cancelling properties. When comparing digital with analogue, the audio quality of analogue gradually deteriorates with static noise as the distance increases. On the other hand, digital provides stable audio for longer than analogue until the edge of the communication range. A new alternative, Icom's IP Advanced Radio System? Icom’s IP Advanced Radio System which works over wireless LAN (WLAN) and IP networks. The system utilises a network controller and remote communicators/handsets and provides secure conversation via WLAN security protocols (WPA-PSK and WPA-PSK2). There are strong reasons for customers to move towards this new technology including no licence fee, encrypted communication, excellent audio quality and the possibility of providing full duplex comms when a headset is used. The IP Radio system can be used like a normal radio system with individual and group calling. The controller has the technology to make group calls and for putting individual calls through. All of this is done by allocating each individual handportable a personality on the system. It’s a direct replacement to radio systems with increased capacity, but using different technology. In terms of installation, the system can be so much simpler. To put communications in a large building you would traditionally use a distributed antenna system maybe including a lift shaft to get full coverage. Now with the Icom IP Advanced Radio System the process is much simpler as it uses wireless access points around the building. 8. What features do I need on a two way business radio? Two way business radios can be purchased with a variety of functions and features ….here are just a few that you may want to consider. There are many features that can be installed or programmed into a two way radio. The ‘Emergency Call’ of ‘man down’ feature enables the radio user to immediately notify all other radios on the same channel. For example, if the radio users should become injured, trapped or in danger, a simple push of a button will call everyone and the microphone on the radio is automatically activated for a brief period so the users can call out a message. Good quality radio units allow you to switch between high and low power modes. Low power reduces the range of your two way radio, but it extends the life of the battery and vice versa. Some radios also let you program the power mode on individual channels so some channels can use low power , while other use high power. Headsets, spare Batteries, cases, belt clips and speaker microphones are often a necessity. Check out our range of two way radio accessories to find the accessories you are looking for. If your organisation operates multiple shifts, you might want to consider a six way rapid charger like the Icom BC-121N and have staff share radios. To allow seamless operation, why not invest in extra batteries. A warranty is mandatory but it is also a guarantee of peace of mind when you are purchasing a radio that the dealer and manufacturer can back up what they are saying in terms of product quality and build. All of Icom UK’s business radios (radio body only) come with a 2 years parts and labour warranty. 9. What will it cost? OK, the big question…unfortunately that is the one question we cannot answer, but your local Icom business radio dealer can. Often you will find that the radios you actually need are much more affordable than some you might have first looked at. Icom have a very comprehensive range at all price levels while still having the same quality and you could consider spreading the immediate cost by leasing rather than outright purchase. 10. Do I need a licence for a two way business radio? You do. You will need a radio licence to operate your two way business radios. This is issued by the Government Agency, Ofcom. Licensed frequencies are allocated on a case by case basis. You can get your dealer to program them into your radio. Get your local dealer to help with the licence application, they will advise on the best way to apply to get the channel you need. If you wish to use your radios all over the UK and are not based in one fixed location, you can apply for a Business Radio Simple UK licence which is £75, renewable every 5 years. 11. Where can I find more information about a two way radio scheme? As mentioned earlier, it is always a good idea to take advice from your Icom business radio dealer. He can help you analyse your operational needs and recommend the features you do and don’t need. He can also guide you through the complicated task of getting a business radio licence from OFCOM. • Icom UK PMR Private Mobile Radio where you will find information about our range of analogue two way business radios. • Icom UK Digital Two Way Radio where you will find information about our range of digital two way business radios. • Icom iDAS Digital Two Way Radio where you will find information about our latest range of iDAS two way business radios.